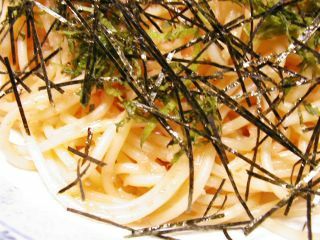 OK, for those (including foodpocket) who are interested in what kind of food we make at the Izakaya where I work, here’s one thing we serve there: Mentaiko Spaghetti. So, what’s mentaiko? This site explains what it is. (See Karashi-mentaiko there.) 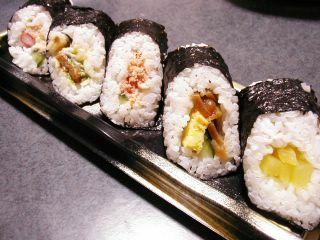 Some people like it on cooked white rice or in onigiri (rice balls), and some people use it for making fried rice. 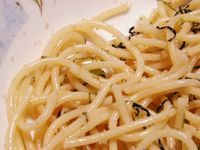 There was no such thing as mentaiko spaghetti when I was a kid, but maybe in the past 15 to 20 years, it has become popular in Japan, I guess. 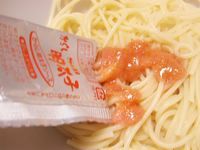 Again, I usually depend on the “seasoning paste” when I make mentaiko spaghetti. I guess the paste is mentaiko mixed with veg. shortening or something, and maybe artificial color, too? I add a little bit butter when mixing the paste and spaghetti just like they do at the Izakaya (I'm not allowed to make this　there. Cooks do). See the tiny, pink fish eggs on pasta? 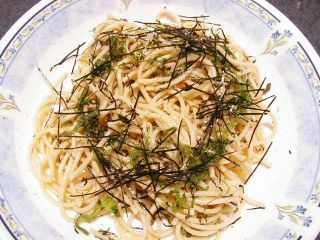 And this topping --- thinly sliced shiso (green perilla) leaves and thin nori (dried seaweed) strips --- is exactly what they sprinkle on this a bit spicy spaghetti at the Izakaya. This is not the most popular dish at the Izakaya I work, but some people seem to love this very much. 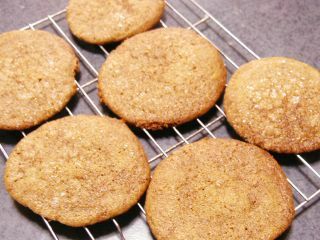 I didn’t blog about it, but I’ve tried out Alicat’s Soft Ginger Cookies about 3 times since I saw her post last October. Every time they turned out really tasty, but my cookies never looked like hers… mine always turn out a little thicker, with no crack at all. BTW, the molasses costed about US$ 6.50. OK, here’s my confession: I know almost nothing about Mexcan food. Can I call this Chicken Fajita? 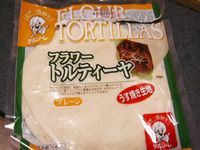 I've been to some Mexican restaurants/fast food places both in Japan and the U.S. including Taco hel..., sorry, Taco Bell in the past. I’ve had tacos. I’ve had fajitas. I’ve had chilli con carne. (They’re all Mexcan food, right?) I liked them all, and I have a craving for them once in about every 4 to 5 months. 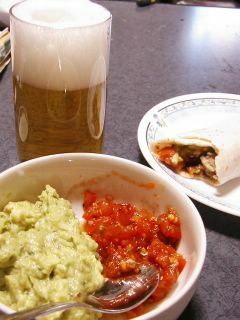 Today I was in the mood for a bit spicy Mexcan dinner with beer, so I decided to use up the leftover “burrito seasoning mix” I had in my kitchen for a while. 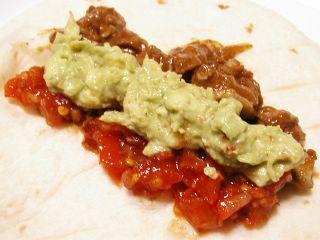 I also wanted to have guacamole which I fell in love with when I first tasted it in AZ, USA. So I bought a very ripe avocado and, again using up a bag of seasoning mix, made some guacamole. To add some nice and fresh tomato flavor, I chopped up a ripe tomato and mixed it with “salsa seasoning mix.” I know...I can’t survive without “seasoning mix” stuff when it comes to Mexican dishes. So now you know my ignorance. OK, here comes another ignorant question of mine… when you put all these (chicken and onion slice seasoned with “burrito seasoning mix,” guacamole, chopped tomato seasoned with “salsa seasoning mix” and cheese) wrapped in lightly toasted tortilla, can I call this “Chicken fajita?” And another one: What’s the difference between “taco seasoning mix” and “burrito seasoning mix”? Are they very different? 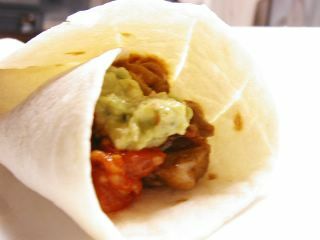 Anyway, this fajita tasted pretty good. This dish definitely warms you up on a cold winter day. 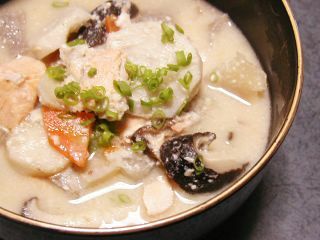 The secret ingredient is sakekasu (sake lees) dissolved in the soup. 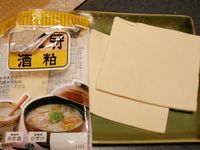 It makes the soup really thick and gives rich flavor by adding subtle sourness(?). 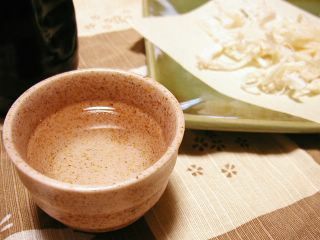 If you put too much, the alcohol in the sakekasu might make you sweat quite a bit. You can put meat and vegetable of your choice, but root vegetables like daikon, carrot, taro and pork or fish are popular ingredients, I think. 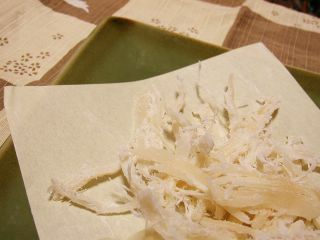 Konnyaku and aburage are also good in kasujiru. This time I put daikon (from my boss again. Thanks! 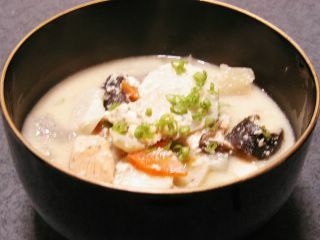 ), carrot, taro, shiitake, salmon and konnyaku in this tasty soup. Salmon tasted soooo good in this soup! Actually I’m not very good at making kasujiru. Good cooks seem to be able to season this soup without making it brown with soy sauce, but I always end up with pretty dirty-colored kasujiru even if I used light soy sauce. I heard the trick is using salt and a little miso effectively. Well, looks like I need a bit more practice. 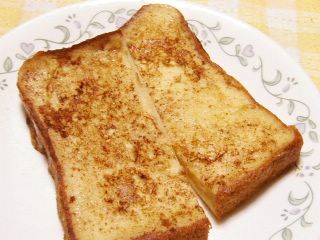 This doesn’t happen too often, but I felt like having French toast for breakfast this morning. Today I sprinkled a little cinnamon over the toast and didn’t use any syrup. My sister adds just a bit of instant coffee into the egg and milk mixture. She said she got that idea from some kind of women’s magazine. OK! Finally, the comment problem is solved! Somehow my comment system kept giving me errors when I tried to update it, so it took half a day for me to fix it. Sorry I couldn’t respond to your comments earlier! Please forgive me. Last weekend was just too … what should I call it… CRAZY! This is the pic from the crazy weekend. 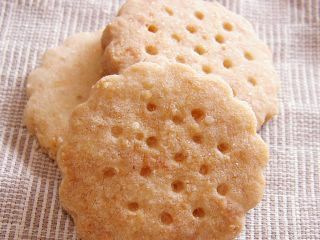 This is Cheddar Cheese Shortbread that I baked Saturday night for a fundraising event on Sunday. 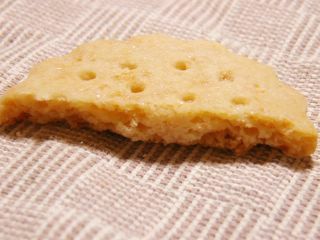 To make this, I sort of combined 2 shortbread recipes: lemon shortbread and cheese shortbread. What was crazy was that somehow my laptop had a local-network error or something Friday night, and I completely lost access to the internet. On Sunday, I excused myself for a while from the fundraising and brought my laptop to a computer shop and had its setting fixed there. So Sunday night after the fundraising was over, I was all ready to blog again, then the laptop gave me the same network error again!! It took me a long time to figure out what was wrong --- I had to reset the ADSL modem. My mind was fully occupied with that problem, so I totally forgot that I kept hot water running to fill the bathtub while working on my laptop and modem. The water was overflowing when I finally went to the bathroom (and the gas was automatically shut down because it was running over 1 hour, so it was cold water that was overlflowing from the bathtub). I had to get outside to release the safety-device for the gas. Then I went back to my laptop, finally fixed the problem, and started responding to the comments I got and left unresponded over the weekend. It didn’t work… the Blogger’s comment update broke the BloggerHacks comment function. I thought I had enough for one day, so I shut down my laptop, took a hot bath and went to bed last night. This morning, feeling refreshed from the good sleep last night, I finally fixed the problem with the comment system, after some errors. Well... it feels so good to be back in my normal blogging environment, after all. Looks like something’s wrong with my comment system. I’m trying to fix it, but it might take some time. Please be patient. OK, I was tagged by Alicat of Something So Clever and here’s my addition to this music meme that’s going around. I don’t know if anyone would ever be interested in what kind of music I like, but oh well, what the heck. I’ll participate anyway. None. My PC is not for music. Breathless by Kenny G ..... Gosh, I haven’t bought any CDs since then?!?! Well, I always rent CDs and almost never buy one. That’s why. CDs are so expensive here!! Just When I Needed You Most by Randy Vanwarmer …. I heard it in a TV commercial (Toyota’s car) just before I read this message. Write down five songs that you often listen to or that mean a lot to you. Oldies, oldies...of course, what else? Think about my age…. 1. Almost everything by Simon and Garfunkel. 2. Hotel California by Eagles … I felt chill all over when I first listened to this song. 3. Shimauta by The BOOM… Beautiful anti-war song from Okinawa, Japan. 4. Sailing by Rod Stewart … The song I want to have on at my funeral. 5. Bed of Roses by Bon Jovi … I don’t know why but I often find myself singing this song when washing dishes or chopping up veggies. Jonny at Jonny Angel--- I’m really curious about what kind of music he likes. MrsT at MrsTweety a.k.a The Crazy Chinese Woman --- She’s a friendly person who visits my site often. Hope she likes this kind of game. 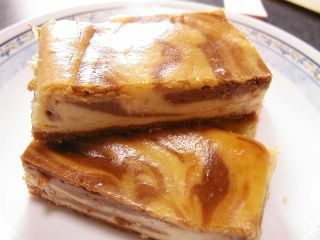 I don't know if it was just me or this cheesecake... this turned out rather tasteless. Maybe because I used regular white sugar instead of the granulated sugar which was called for in the recipe? 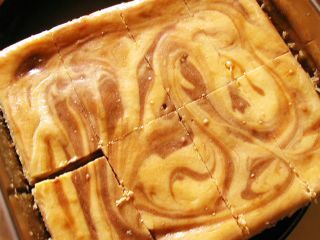 Also, I melted regular (cheap) milk chocolate to make the swirl, because I didn't feel like going shopping just for the chocolate... I had all other ingredients at home. I would have been really proud of myself if I had made all these, but no, I bought these at a nearby supermarket. I heard that many non-Japanese people have problem with this chawan-mushi, because it looks like custard pudding but actually not sweet at all and instead has strong dashi flavor. Sometimes things like chicken pieces and shrimp are hiding inside. 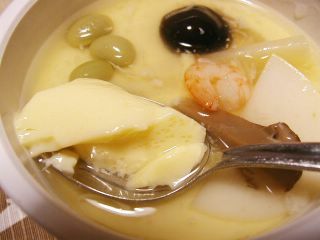 So you’ll really have to forget about custard pudding and see this chawan-mushi as something totally different. They didn’t taste very good, but I was just too hungry. It's been so cold for the past couple of days. We had very few customers at the Izakaya and we were bored and cold in the kitchen. It’s no fun riding a bicycle at night after such an unexciting work, being almost frozen to death. I'm going to have a very good sleep tonight. 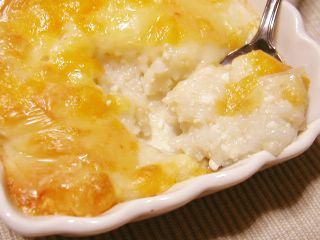 I mixed the grated yam and silken tofu, seasoned with dashi stock and soy sauce, then sprinkled cheese on top and baked in toaster oven. The taste needed some improvement, but I think it looks OK in the photo.